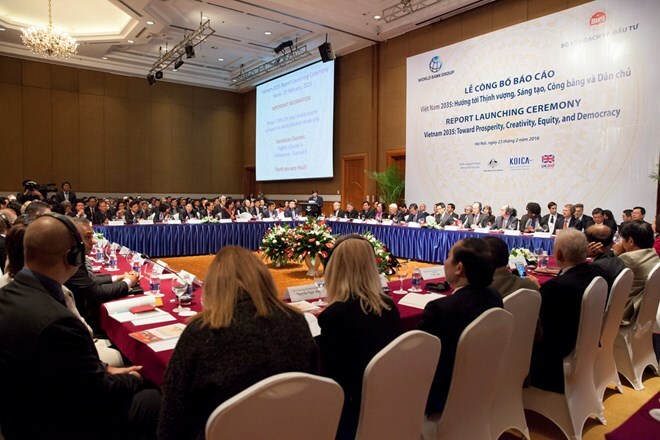 Hanoi (VNA) – The Vietnam Chamber of Commerce and Industry (VCCI), the Ministry of Planning and Investment and the World Bank jointly held a seminar in Hanoi on May 30 on the role of the business community as well as need of institutional reform in the Vietnam 2035 Report. The report “Vietnam 2035: Toward Prosperity, Creativity, Equity and Democracy” lays out a path for the country to reach upper-middle income status by 2035. In the report, Vietnam sets goals for modernising the economy, increasing the competitiveness of the private sector, the effectiveness of urbanisation and the capacity of climate change response, ensuring social equality for vulnerable groups, and building a modern rule-of-law State. To that end, Head of the Central Institute for Economic Management Nguyen Dinh Cung said that Vietnam should become a more competitive, transparent and democratic market. Pham Dinh Toan, Chairman of the Phu Thai Group, said that business will decide the success of institutional reform. From now to 2035, employers should improve their knowledge and capacity as many businesses cannot grow as the awareness of their leaders has yet to meet the requirements of the integration process, he added. At the event, delegates recommended Vietnamese enterprises pay more attention to exports, particularly in Vietnam’s strongest fields like seafood processing, garment and textiles and electronics.